BRIDPORT Literary Festival, from 4th to 11th November, has a dazzling line-up including the Great British Bake Off’s Prue Leith, Fay Weldon, Penny Junor and Patrick Gale. 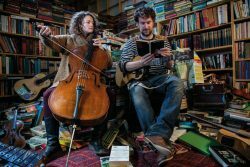 The 14th annual festival opens at Sladers Yard, West Bay, on Sunday 4th November at noon with The Bookshop Band (pictured) – Beth Porter and Ben Please – who bring books to the stage along with a multitude of instruments including cello, harmonium, glockenspiel, guitars and ukuleles. The venue also plays host to The Glass Aisle on Sunday 11th at noon with ex-Stornoway frontman Brian Briggs and poet Paul Henry. This stunning long poem is set on a stretch of the Monmouthshire – Brecon Canal, breaking down borders between the poem and the song lyric. Many of the events are at the Bull Hotel. Matthew Sturgis unveils the first major biography on Oscar Wilde in 30 years when he talks on Oscar: A Life, in the ballroom on Thursday 8th at 2.30pm. This event is in addition to those already in the published programme. Sturgis brings alive the radical ideas, the distinctive characters and the flaring colours of the fin de siècle to write the richest account of Wilde’s life to date. Love letters discovered in an old chocolate box inspired Simon Worrall to write his novel, The Very White of Love. The book is based on letters between his mother, Nancy, and her fiancé, Martin Preston, a nephew of the poet Robert Graves. The author will be at the Bull on Thursday 8th, talking to Sally Laverack. Edward Wilson-Lee gives an illustrated talk on Christopher Colombus’ illegitimate son, Hernando, in The Catalogue of Shipwrecked Books, at The Bull on Friday 9th. Hernando helped make the first modern maps of the world. Royal expert Penny Junor has stepped in at the eleventh hour in the place of author and journalist Bryony Gordon, who is unable to make the festival due to exhaustion. Penny will be at Bridport Electric Palace on Saturday 10th at noon. She will be talking about All The Queen’s Corgis, an affectionate and entertaining book about the dogs that have been bred, owned by and given to the Queen throughout her life. For more information visit www.bridlit.com and for tickets contact Bridport Tourist Information Centre on 01308 424901. Posted in Words! Words! Words! on 26 October, 2018 .